Oh hello there, I’m just sitting here enjoying my tree which is sheltering all the gifts we’ve gotten so far. For people, not that we’ve received. That’s totally different. Anyway, It’s delightful to have an under-tree full of gifts, partially because it keeps my cats from running rampant under the tree skirt, but mostly because it’s just so Christmasy! I’ve been wrapping gifts for two days now. It’s been a “oh I have an hour here, I should do that!” kind of process. I usually prefer to sit down and do them all at once, usually with the Muppets on, but not this year. It’s okay, though, I have people to watch the Muppets with me. It’s very important, you know. So instead I put on some Christmas music on Wednesday and got half of my wrapping done and then managed the rest yesterday while listening to the Psalms. You may be judging me now, but that’s okay. The Psalms are wonderful and I love them. This year everything is in a box. Even the things that weren’t in boxes are in boxes. I decided it was easier and since we have Amazon Prime this year and don’t have to pay for shipping we ended up with a bunch of small boxes instead of a couple big boxes from all of our Amazon purchases. So I figured, why not put them to good use? I had to buy some clothing boxes this year, instead of trying to awkwardly wrap floppy fabric things. The only thing is, the boxes were much deeper than I had anticipated. That was okay for the gift of all the sweatshirts, (which I can say here because they’re for one who does not internet and won’t read this unless someone else shows it to him), but not so much the single clothing item. I did a lot of tissue packing. But, over all, the weirdest shape I’ve had to wrap this year has been a box with that sticky up part for hanging it up in the store. Which I only now realized I probably could have just taped down and it would have been fine. My cats have been surprisingly good with all the wrapping going on. 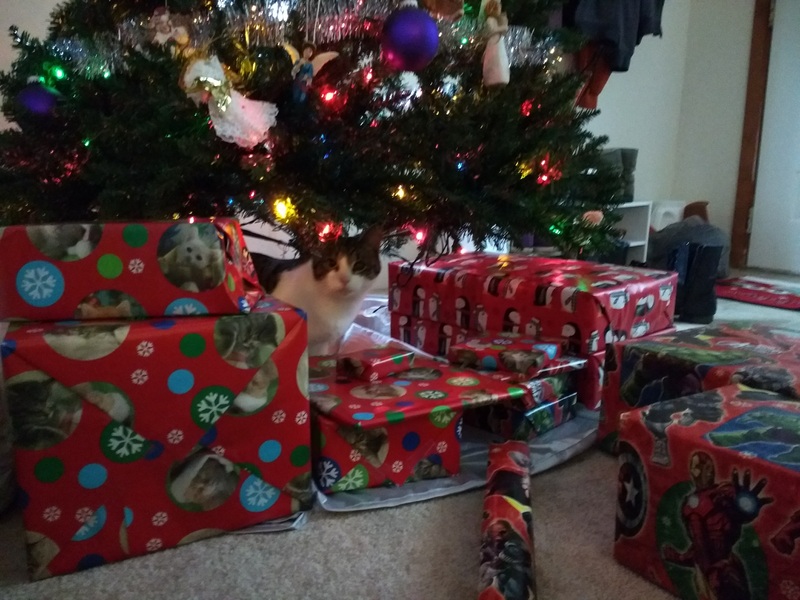 In the past I’ve wrapped gifts for birthdays and showers and such and found that Miss Calamity has a tendency to play with the paper if she gets a chance. It’s annoying as she has claws and claws rip paper. But as I sat in the middle of my pile of gifts and gift wrapping paper they didn’t bother it too much. I did get a very cute picture of Calamity playing with the tissue paper, but she didn’t bother the stuff I was working with. Yesterday she was distracted by playing with my pen as I was wrapping, so I think that kept her out of my hair for the most part. I will definitely need more wrapping paper for next year. I have almost completely used the stuff I got two years ago and am left with the one roll I got this year and one from last year. I got a very cute kitten wrapping paper from the dollar store before Thanksgiving and was very excited about it. I did all of Logan’s gifts in it and thought about just wrapping everything in it, except then it would be harder to tell gifts apart. I have traditionally done Logan’s family in one wrapping paper and my family in another so they’re easy to sort. We put labels on them but that’s only good for the siblings. I label all the parents “Mom” and “Dad” so that doesn’t help too much when there are two moms and two dads and they’re all in the same wrapping paper. I did have the perfect square of kitten wrapping paper for one of the dad’s gifts, though, so I used it. I have no regrets. Do you know how good it feels to cut a piece of wrapping paper out, use it, and have the trimmed part be perfect for another gift? It’s so economical! 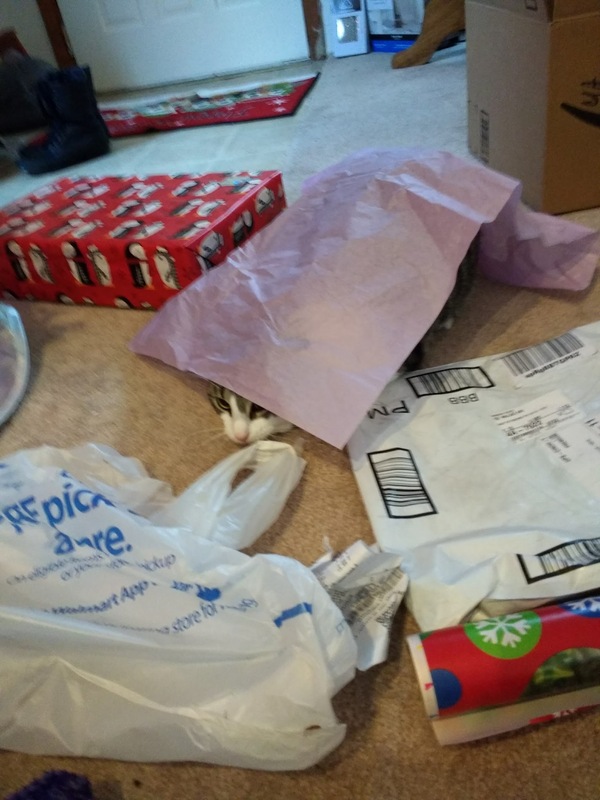 The problem is, of course, that the cat wrapping paper is good for everyone. Both of our families are super into cats so how could I possibly choose between them? I think I will just have to save the kitten wrapping paper for Logan and leave it at that. Next year I’ll have to look for new wrapping paper for both families. The one from last year might do me for one side, but there are no guarantee of that. The penguins only got me so far this year. 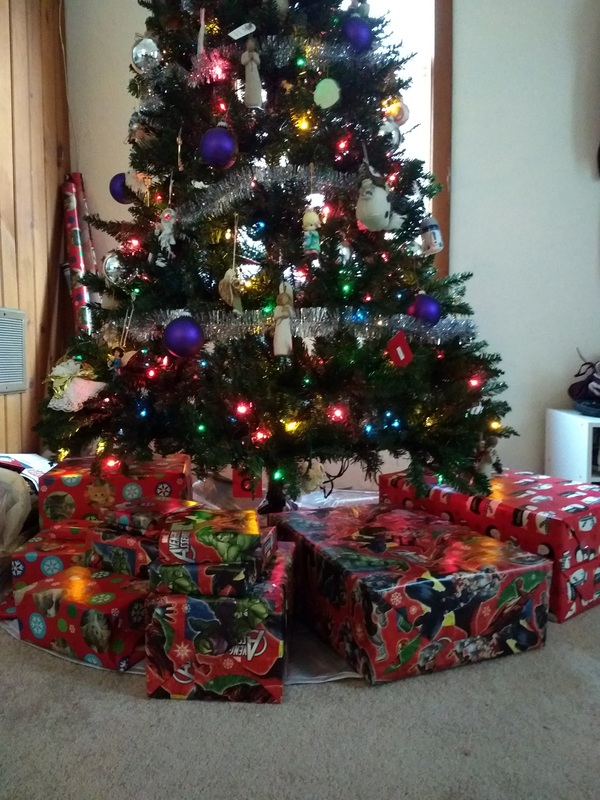 I love the look of the tree with all the presents underneath. It’s not a thing we did back home growing up. I don’t think a lot of people do that, actually. That whole Santa bringing presents thing, it would kind of ruin the illusion to put presents out before then, I guess. And I’m thinking when we have a baby that won’t be a great plan. Babies have no self-control, after all, and like shiny things. But, for now I will enjoy my handy-work on display. Have a lovely weekend, my friends.